Зеркало" сайта LocalBitcoins.net уже активно! // LocalBitcoins.net mirror site open! После того как мы были заблокированы Роскомнадзором в начале сентября, наша команда начала работать над тем, чтобы сделать пользование нашим сайтом, возможным для Вас. Итак LocalBitcoins.net является первым зеркалом нашего сайта. “Зеркало" работает уже несколько недель, никаких проблем в процессе не возникало, и оно полностью готово к использованию. Если наш основной сайт LocalBitcoins.com заблокирован Вашим провайдером, Вы можете воспользоваться официальным "зеркалом" -- LocalBitcoins.net. На данный момент только этот сайт является официальным зеркалом LocalBitcoins. В будущем создание "зеркал" будет происходить быстрее. Если у Вас остались вопросы, комментарии или проблемы с "зеркалом", обратитесь в техподдержку. After we were blocked by the Roskomnadzor in early September we started working on changing the site to make it possible for us to easily create mirrors to make it easier to access. LocalBitcoins.net is the first mirror site that has been enabled. We have been running the mirror for a few weeks with no problems and it is now ready to use. If you have problems visiting our normal website at LocalBitcoins.com, you can instead visit LocalBitcoins.net. At the moment this is the only mirror we have enabled. However we will now be able to create new mirrors faster in the future. If you have any questions, comments or problems with the mirror please open up a support ticket from our website. Недавно Роскомнадзором было принято решение заблокировать LocalBitcoins в России. Для нас, так же как и для Вас, подобное решение было крайне неожиданным. Инструкции, приведенные ниже, помогут Вам продолжать пользоваться нашим ресурсом, не смотря на блокировку LocalBitcoins. ВПН (виртуальная частная сеть) является сервисом, который Вы можете использовать для установки прямого зашифрованного соединения между Вашим компьютером и сервером в другой стране. Это означает, что вместо того, чтобы напрямую посещать сайт со своего компьютера, Ваш интернет трафик сначала шифруется, а после этого отпраляется на сервер ВПН провайдера. Оттуда трафик проходит на сайт, который Вы хотите посетить. Это не только позволяет Вам совершать вход на LocalBitcoins, но и на любой другой сайт, заблокированный в Вашей стране. ВПН так же устраняет возможность Вашего интернет провайдера контролировать Ваши действия и коммуникацию в сети, так как Ваш трафик зашифрован. Lifehacker написал отличную статью на тему, почему необходимо использовать ВПН. В мире существует несколько тысяч ВПН провайдеров, что делает выбор сложным. Сайт thatoneprivacysite.net создал хороший список различных ВПН провайдеров. Вы можете использовать данный ресурс для выбора, подходящего Вам провайдера. Мы решили отметить несколько опций, которые, на наш взгляд являются достойными. Вам необходимо зайти на сайт ВПН провайдера и создать аккаунт. 2 из вышеуказанных провайдеров предлагают бесплатный сервис, но трафик (как часто Вы пользуетесь интернетом) лимитирован. Если Вы используете ВПН лишь изредка, то подобный вариант Вам вполне подходит. Если же Вы хотите использовать ВПН довольно часто, то мы рекомндуем выбрать платный ВПН сервис. После того как Вы сделали выбор ВПН провайдера и зарегистрировались на их сайте, Вам необходимо будет установить програмное обеспечение на своем компьютере, которое позволит Вам подключиться к сети ВПН. У многих ВПН провайдеров свое собственное программное обеспечение, которое Вы устанавливаете для того, чтобы подключиться к ВПН, такой способ является самым простым. Вам лишь необходимо скачать приложение, установить его на компьютере и совершить вход, используя свое имя пользователя и пароль для ВПН сервиса. Ниже ссылки на инструкции по установке, предложенных нами ранее, ВПН сервисов. Инструкции от IPVanish для установления ВПН на всех операционных системах. Если Вы уже зарегистрировались на сайте, предлагающем ВПН сервис, скачали программное обеспечение и установили его на своем копьютере, Вам осталось всего лишь подключиться к ВПН и открыть браузер, как Вы всегда делали, и совершить вход на LocalBitcoins.com. Если все было сделано верно, то сайт LocalBitcoins.com откроется без каких-либо проблем. Ваш интернет провайдер лишь будет видеть, что Вы используете ВПН, но информация о том какие сайты Вы посещаете и что именно делаете, им будет недоступна. It is still about Bitcoin, not about "blockchain"
Show me the point where blockchain passes bitcoin in google trends. I did not give too much thought about the issue at the time, since the guy was somebody I have never heard of, and I don't care too much about such details in general. 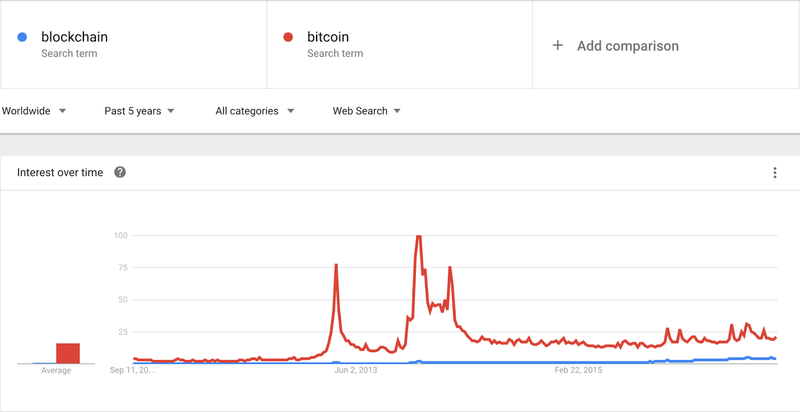 I mean blockchain passes bitcoin in google trends, who cares? Anyway, there was still this nagging voice in my head, that I have seen the something similar somewhere else as well. That happened to be true, since I had seen the following graph presented in the Helsinki blockchain conference couple of weeks ago*. 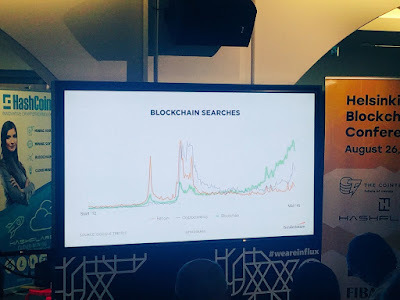 Edit 9th of September 2016: Some of the wording was edited, since as I discussed with the presenter, such claim, that blockchain has passed bitcoin is search amounts was never made. As pointed out by the presenter, the graph is trying to explain current hype moment of certain search terms, but he certainly understood that you can get the wrong impression from the slide out of context. You see, bitcoin is going nowhere! Perhaps you can make a sincere mistake with your slides you have created couple of hours before your pitch, but guess what? Same kind of graph can be found from CreditSuisse report as well. Of course, you can see the difference here; they have made their own chart called "Google trend momentum", where you just search each trend individually, and add them up as one. I don't know how scientifically valid method this is, but I can totally understand if someone gets a wrong impression from these charts. 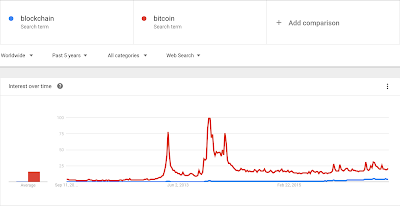 If you are using Google trends as a reference, at least it would be somewhat fair to add the fact that bitcoin is still around five times more searched term than blockchain. It is true that miracle word "blockhain" has been popping up more and more lately, and the graph shows that blockchain hype is growing, but this kind of graphs make you wonder if it is really based on any real life solutions, or is it just these "blockchain experts" who are making up the buzz. Over the years the UK has been an important market for LocalBitcoins, especially back in 2012 when we were founded. The UK helped solidify the future of LocalBitcoins by being the first market to see growth in P2P trading which gave us enough money to hire our first employee. This year we've had to watch as our friends in the UK suffer through hard times after the results of the Brexit vote on June 23rd. Since then we've seen value of the pound gradually drop in value by 16%. We remember the support you gave us in our early days, now it's time for us to give back and help you get out of the pound before it's too late. From this Monday, the 5th of September, we will halve the LocalBitcoins trading fee from the current 1 % to 0.5 % for all Bitcoin trades done in the UK*. The reduced fee will be active for trades started between Monday the 5th of September at 12:00:01 AM UTC and 11:59:59 pm UTC October 2nd. LocalBitcoins is the world's leading peer to peer Bitcoin exchange where users buy and sell Bitcoins directly from each other. Founded in June 2012 LocalBitcoins is one of the oldest Bitcoin exchanges and as of August 2016 LocalBitcoins has more than 1 350 000 registered users from 249 different countries exchanging $14 000 000 worth of BTC every week. * LocalBitcoins reserves the right to change the conditions of the campaign at any time. At the time of the Bitfinex hack last Tuesday the default price equation in use for LocalBitcoins advertisements was taking pricing data from Bitfinex. When trading was stopped on Bitfinex, advertisements using the default price equation on LocalBitcoins stopped working. We have since disabled all advertisements that use Bitfinex in the price equation to make sure there are no advertisements active with the wrong price. To replace the old default price equation, bitfinexusd, we introduced a new pricing source called btc_in_usd. Instead of relying on pricing information from one source, this equation takes pricing information from 7 different sources and calculates a median price which is used. This makes it much more resiliant for situations where the price source gives incorrect, erroneous data or stops working entirely. Many of you rely on the default price equation with your advertisements, with this new change we want to make sure it's as reliable as possible. The btc_in_usd price source takes data from the following sources, and calculates a median price. Pricing equations can be a powerful tool for managing the price of your advertisements. To get the most out of them, you can have a look at our pricing guide which explains in detail how they work. Earlier today we improved on how transaction fees are calculated, fees for outgoing Bitcoin transaction are now paid once every hour based on the average fee per transaction instead of directly after every transaction. Last year we changed how fees on outgoing Bitcoin transactions were calculated from a fixed fee model to a dynamic model based on how congested the Bitcoin Blockchain is. This helps to ensure that every outgoing Bitcoin transaction from LocalBitcoins gets confirmed within the first three blocks of the transaction being sent regardless of how many transactions are waiting to be confirmed. After this change we noticed that the transaction fee can change within a large margin from transaction to transaction. Now to help make the transaction fee more predictable we're collecting all Bitcoin transaction fees paid during the past hour and averaging them out over all sent transactions during the same hour. This will help to keep the transaction fee consistent and more predictable when you send Bitcoins to other wallets. For example; During the past hour you've made two outgoing transactions from LocalBitcoins. In total LocalBitcoins users made 100 outgoing transactions for a total transaction fee cost of 0.005 BTC during the same hour. For your two transactions, you would pay 0.00010 BTC (0.00005 + 0.00005) as a transaction fee. The transaction fees for your outgoing Bitcoin transactions will be paid from your LocalBitcoins wallet once every 6 hours, in case your wallet is empty the fee will be taken from your next Bitcoin purchase or incoming Bitcoin transaction. The fastest way to buy Ethereum (ETH) is, oddly enough, to first buy Bitcoins and then to convert it to Ethereum. Don’t lose out waiting several days for an international bank transfer, use LocalBitcoins and Shapeshift to make the transaction in less than a day. TL;DR, how do I do it? The shorthand version, follow these four steps. If you’re not signed up, register for an account on LBC. Search for advertisements using bank transfers or cash deposit. They’re the fastest payment methods. Choose an advertisement & buy Bitcoins. Convert Bitcoins to Ethereum using Shapeshift.io. How can LocalBitcoins be faster? The most difficult and time consuming part of buying any cryptocurrency, including Ethereum, is converting from fiat to crypto. Traditional cryptocurrency exchanges require you to deposit money using a slow bank transfer, often an international SWIFT or a European SEPA transfer. This will take a couple of days or longer. LocalBitcoins is faster than other exchanges because we’re a peer-to-peer exchange. Instead of buying from a centralized company, you buy Bitcoin directly from people who live in your own country. There are thousands of traders selling Bitcoin for 60+ payment methods all over the world, this means that it’s very easy for you to find a trader that is online and able to make a quick transaction. The fastest payment method on LocalBitcoins is Bank transfers within a country or within a bank. This connects you to a trader who uses the same bank as you or another bank in your country, these transactions take minutes to hours instead of days. For help with completing your trade on LocalBitcoins, you can find our how to buy guide right here. It will show you step-by-step how to buy. We recommend you use Specific Bank Transfer, National Bank transfer or Cash Deposit as the payment method to get the fastest trade.